Vice Chancellor of the Kwame Nkrumah University of Science and Technology, Prof Kwasi Obiri-Danso has expressed happiness over achievement of the University over the years indicating, it has become a champion in Accra. While addressing thousands of graduates during the 2018/19 special congregation for post-graduate students of the university held this February at the great hall of the university, the Vice Chancellor cited instances where the university has distinguished itself from our university in Ghana and the sub-region. The Vice Chancellor fondly recalled when the Chinese ambassador to Ghana, His Excellency Sheng Tin Yong visited the university and described it as one with the most beautiful campus in Africa. KNUST, located in the middle belt of the country mainly in forest zone of the country is noted for its green scenery. “The campus of this university is very beautiful. 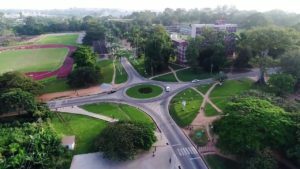 This is the most beautiful campus I have ever seen in Accra” The Chinese ambassador to Ghana had said. The VC also put on record that the University graduated ten thousand nine hundred and seventy-eight students from over sixty-six ministry of health training institutions which are affiliated to KNUST and fall under the direct tutelage of the college of health sciences. He said the university increased enrolled from forty-four thousand last year to fifty-five thousand this year with an assurance that the university is ready to do more. The vice-chancellor also taunted the strides of the university in Africa with a special mention of last year’s pan African Debate Championship (PAUDC) which KNUST won to become the first sub Saharan country to win that trophy. “My students continue to soar, the debate team of KNUST made history and emerged as overall winner of the 2018 Pan-African University Debate Championship (PAUDC) held in Tanzania. Mr Boakye Nyamekye Isaac and Mr Erasmus Segbefia who represented the university beat off stiff competition from one hundred and sixty debaters from forty nine top African Universities who participated.” The VC said with rapturous applauds from the graduates. The Vice Chancellor added his voice to the call by the Chancellor of the university, His majesty Otumfour Osei tutu II, the government should complete the university’s teaching hospital. He also called on the government to employ the teeming PhD holders the university churn out every year so that the university can increase enrollment.